doesn’t that just sound fantastic?! luckily, they leave your hair feeling and looking as fantastic as they sound like they do! today is officially SPRING! and with that comes warmer weather, brighter colors, and cooler drinks! and now – your hair can join in the fun! hair smoothies can be thick or runny, made with vegetables or fruits… but they’re all 100% edible! BONUS – they can go on your face, too! all of these smoothies use pure aloe vera gel as a base. the aloe is scalp-soothing, adds a nice punch of moisture and shine, as well as helps chunks of fruits/veggies be less likely to get stuck in your hair (especially with fine or curly hair). here are all of my yummy favorites! all of these hair smoothies are targeted towards moisture first and foremost, and then shine/softness/clarity. 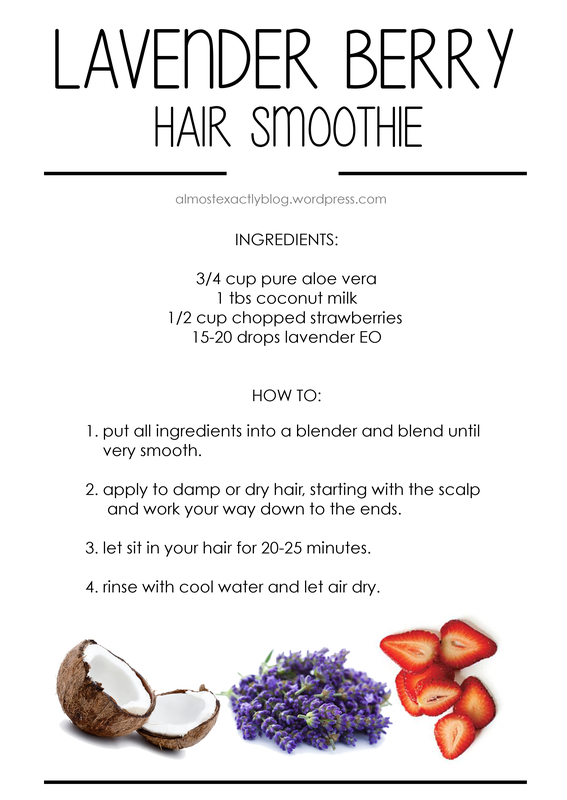 these hair smoothies are great for weekly use! lately, my favorites have been the island breeze & cucumber melon, for shine & moisture. i’ve noticed that the ends of my hair feel a little softer as well. let us know how these went! and leave us more of your favorite combos below! Hey! So I’ve just recently (past two-three weeks) been washing my hair with very diluted Shea Moisture (the moisture retention kind) and a bit of baking soda. I only wash the scalp. Then I do an apple cider vinegar rinse on the ends and recently have switched to using the Shea Moisture conditioner. I wash my hair every 3-4 days, I’m trying to go for longer. Here’s the sitch: my hair feels wonderful except the underside layer of my hair is coarse and dry (I have had this issue for a long time, years) and the ends are fine until you get to the very tips. Then they’re dry and a little tangled and look bent, like crimped. What the heck is happening?! I think it might be split/dead ends so I made a hair appt to get a trim but I wanted to double check with your blog. Eventually I hope to go ROM but I’m starting slow. Would these hair smoothies help my ends? I need help and I thought it would be best to ask on your most recent post! so I first started trying to be more natural with my hair around september (2014) and it overall did not go well for me so I decided to just go low-poo because that would be the most stress free routine. I now have been washing my hair with SheaMoisture shampoo and conditioner since before christmas and have been washing once a week to try and make my hair get greasy slower. once in awhile I do rinses (like ACV) or CO masks (which made my hair fall out when the oil was in my hair) to deep condition and/or help with dandruff (unsure whether it is gone yet). I brush with a BBB and do hairstyles and such with a comb (I try to be as gentle with my hair as possible). I am unable to sleep with a satin pillow case so I braid my hair at night. recently I have noticed my hair seeming to fall out but I assured myself that as long as it wasnt in clumps it was probably ok, but today i noticed my hair kinda falling out in clumps and it kinda scares me/stresses me out (I did wear a french braid in my hair for two days and then a bun so maybe the lack of brushing might be a factor). you said to ask for help if your hair is falling out and I am so unsure of what to do. Help! I was wondering what the best time is to do these smoothies. Before normal wash (wether no-poo, low-poo, or ROM) or after that wash? Or are they better half way between washes? Are certaim recipes nade to focus on certain hair treatments? Like one helps with oily hair, one helps with dry, one helps with damaged, etc.? These look really cute. I’m going to try a few, but I’ll probably end up eating them! I wasn’t sure where to leave this comment, I love your blog and have scoured your blog for any baby friendly recipes – I’ve just had my daughter 7 months ago and want her too, to lead a chemical-free exsistance. She currently uses shampoo, body wash and baby oil – can you offer any chemical-free, natural and baby friendly alternatives or recipes? Thanks for the post – great ideas! Can you recommend a few brand of aloe vera? There are so many products out there, I don’t want to get stuck with a chemical-y one! NICE! and now I am dying for a smoothie! what a treat! Im off to dig up my blender!